if it's a going concern any more. That part of Wisconsin is a nice area. Marinette was a calm, nice town. town and onto rural roads. Not all "growth" is good. Firewood railroad ties golf n silver steam machinery cooking wood heat ...no coal. No oil tech. So the topsoil formed during the last ice age washed away leaving hard ground dirt rock. Tourists look at coastal pasture vista unaware the eco was 150' redwoods n MIST. MIST ! I'be spoken on that n it's trip. A cranial nerve response produces brief facial n body shock ttremors. What grows back is herbaceous brush tinder. I followed the tour over Trinidad. The fireplace chimney photos are mockery of this attitude. The burning of Atlanta fir inexcusable sins against nature. I hike n study this area n frankly intelligent analysis of what you see n what you should do n not do is historically un available. The entire west is a catastrophic eco disaster caused by eco pigs n opportunists. like "tidal wave, tsunami, war, insurrection, etc." "Every single thing NASA says about sea level is fraudulent. NASA’s own data says that Antarctica ice growth is reducing sea level." it down from the mountain, carved on tablets of stone. thing I loved was the city limits really did seem to limit the cities. were in rural farm country. Of course, that was a long time ago. It may be different now. global warning. Electric cars. The sale of farm land to developers missed Ohio ? You certainly show yourself to be both a child of the 80's and financially incompetent as usual. Not to mention either your ability to bluff or absence of understanding what you read. In all likelihood even under the inflated currency you will never earn half of what I did in your entire lifespan. And presently I'm considering a couple of jobs at very large firms that will again put me in the top 5%. And perhaps what is a more interesting position at a smaller start-up that is more in line with actually making breakthroughs. What's in your future? Arguing for gun grabber laws before the Supreme Court? Pffffff (blowing out coffee). Who is the one complaining about being broke and living in a **** hole? Not me. If you've out earned me, you made some staggering f***-ups. You should be retired in style. Yes! My future is subjugating gun owners, liberal conspiracies, walks on the beach and fine wines. If I can find time after my pedicure, I might start a race war. I'm already working with your illegal next-door neighbors to occupy your back yard. NASA.Â* They had to be super-smart to fake that whole moon landing thing. And Jay was given a couple of examples of California fires that were MANY times larger. The 300,000 acre fire was one single fire while the loss of what will be 170,000 acres is 17 fires. There were just five in the wine country and surrounds. From the Pall Mall Gazette 1971: "We have often noticed that in the tabular statements of those compilers of weather records who write to the Times, useful and welcome as their communications are, every season is sure to be â€œextraordinary,â€� almost every month one of the driest or wettest, or windiest, coldest or hottest, ever known. Much observation, which ought to correct a tendency to exaggerate, seems in some minds to have rather a tendency to increase it"
An absolutely PERFECT example of this mindset is Jay. He's cold today so it's the coldest day in history. He's hot today so he believes in the discredited theory of man-made global warming. This was based upon a theory of Arrenhius from the last quarter of the 19th century and was seized upon by environmentalists from the 1980's. They made many claims about how the scientist had proven this and that through direct experiment. I searched out his paper and it was written in German so I had to do a great deal of searching to find a translation. Guess what - he made NONE of the claims attributed to him. He made not one single experiment as he said he did not have the money nor space to do so. Instead his work was based upon another paper about the light reflected from the moon. He made well thought out observations but not one of them would support the man-made global warming theory. This was generated firstly by Dr. Michael Mann. Mann's work ("known as the hockey stick") counterfeited data so blatantly that a Canadian scientist called him on it. Mann made the stupid mistake of suing that scientist in a Canadian court for defamation of character. Apparently he thought that Canadian would withdraw. Suddenly faced with court Mann's legal staff asked for additional time to prepare their case since the Canadian scientist had ALL his ducks in a row. The Canadian's advisers agreed ONLY on the grounds that Mann supply the data he had in totality. The court so ordered..
Mann did not turn his records over. Ask Jay how the court will take this when they reconvene. And the public documents Mann had been bandying about did not show two extreme climate events - the Medieval Warm Period which was warmer than today -significantly so - and the little ice age. By taking these ghastly events out of the data he was free to predict these horrible climate events without anything to compare them with. Since this time NASA and NOAA have been forcing most of their scientific staff to agree with Mann's papers in public. But the worm has long since turned. Scientists from all over the world are plainly saying that these two government entities have counterfeited data. The article here shows how NASA has changed the data sets. Not a great deal mind you, but no change is legitimate unless they carefully explain why. And they have not. You can see the extraordinary changes in the data from NASA. Slightly down the page is a picture of a rock outcrop in La Jolla, CA near San Diego. It shows high tide in 1871 and today. 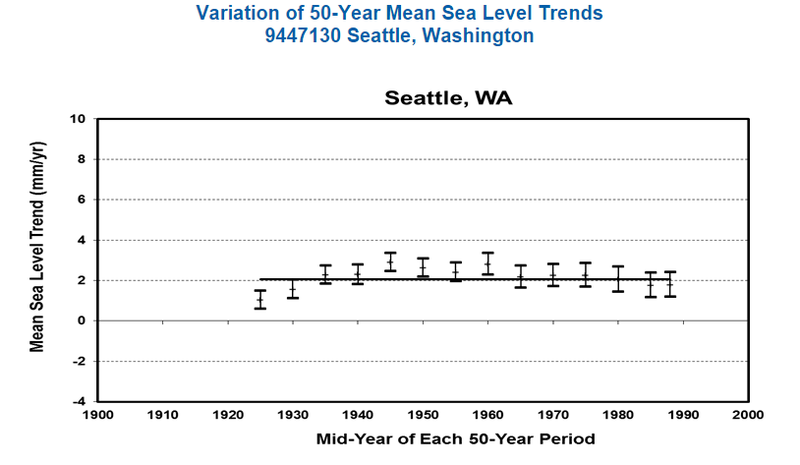 You will note that there is maybe a slight REDUCTION in sea levels. Now of course this could easily be manipulated by not showing the same moon generated tide levels, but that is unlikely since the date of both pictures is public knowledge. As a sailor I could go into the science of tides in depth but it is significant that Jay is willing to make comments outside his area of expertise with such frequency. The one outstanding feature of man-made global warming is that those who know the least science are those that speak of it the most.